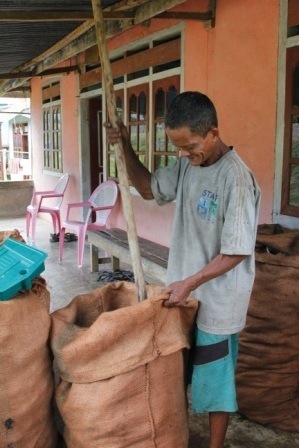 The main livelihood for the people of La Bundo Bundo is farming. This is why monkeys raiding their farms and stealing crops is such a big problem for them. 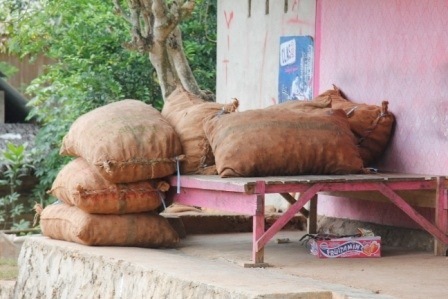 As well as farms of subsistence crops like maize, sweet potato and bananas most people in La Bundo also have farms of longer term crops like cashew nut and coconut which they sell to bring in extra income. 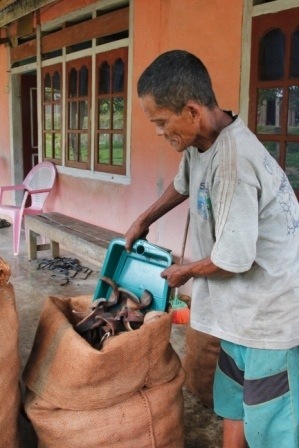 The cashew harvest is once a year, in December and is very dependent on the weather. Too much rain and the harvest fails. This year it’s looking good though as it’s been relatively dry. Interestingly the monkeys aren’t a problem when it comes to cashews. In fact they are welcomed in to the farms. This is because the monkeys only eat the fruit of the cashew, which leaves the nut which hangs beneath the fruit to drop to the ground where it can easily be collected. The farmers tell me they like this as it saves them having to climb the trees to harvest them! Coconuts on the other hand are a different matter. 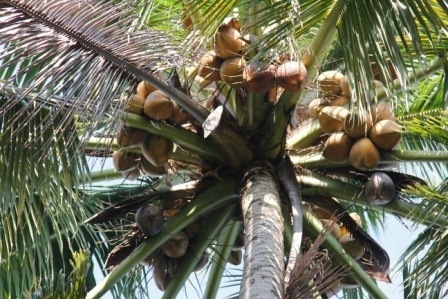 The main use for coconuts is to be sold as copra. 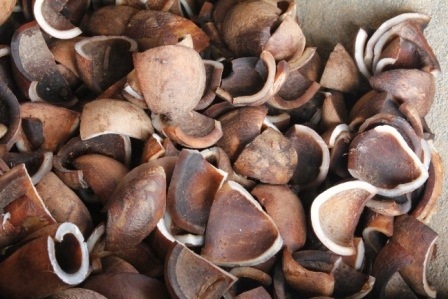 Copra is essentially the dried coconut meat and it’s sold for use in cosmetics and food production. 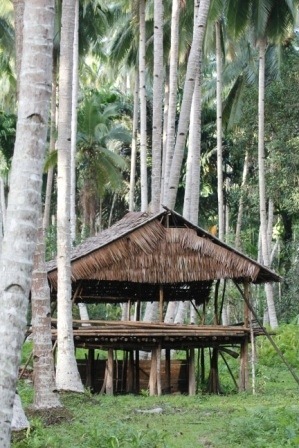 It’s a more reliable livelihood as the coconuts are ready for harvest every 3 months so you can get an income all year round. Depending on the species it takes around 7 years for a coconut to start producing fruit so most people’s farms are pretty old. 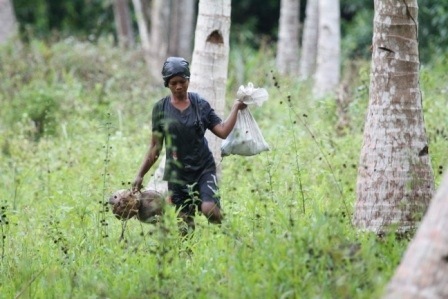 The standard practice is to start planting coconuts amongst the subsistence crops when you open a new farm so for the first 3- 5 years you focus on subsistence crops while the coconut etc is growing, then you leave it to just mature. 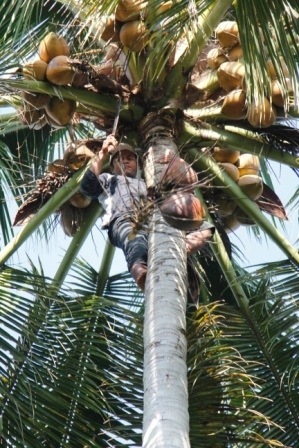 Every 3 months the coconuts are harvested. This involves climbing up the trees and cutting down the fruits. You can pay someone to climb the trees for you – the going rate is 3,000 rp per tree (approx 25p) or you can climb then yourself. 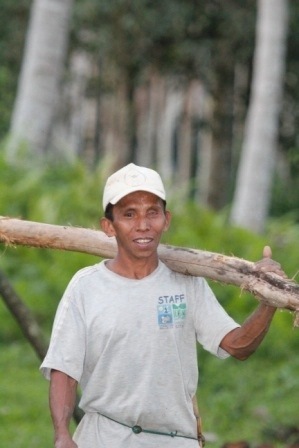 This farmer, La Sali, can climb up to 40 trees a day harvesting coconuts! That requires amazing strength, and nerve! 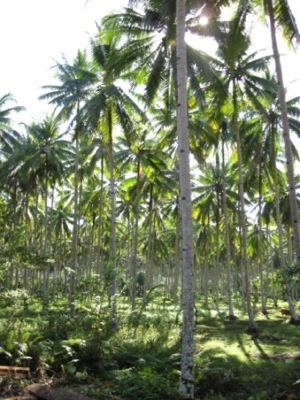 100 trees produce around 2000 – 2500 coconuts. 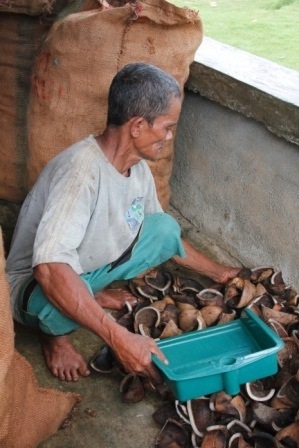 Once the coconuts are harvested they are collected and the husk is removed, the nut is opened and the water drunk or discarded. The nuts are then split and left in piles in the farm hut to dry. They often light fires under the hut to help dry them. It can take up to a week or more to dry them. It’s now copra! The shells with the dried meat are then cut up further and sorted in to sacks. Each sack contains about 60kg or so. 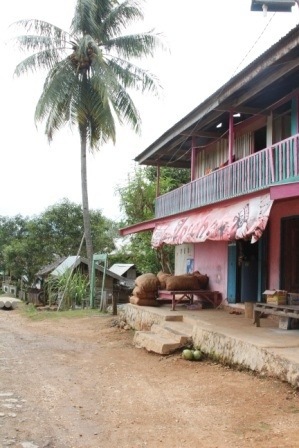 400 coconuts yields about 100kg of copra. Once the sacks are ready they’re stacked up ready to be driven to the capital to be sold. 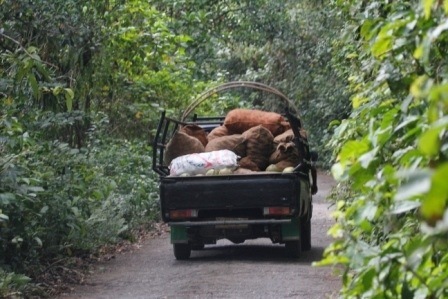 It costs 32,000rp (approx £2.45) per 100kg to get the sacks transported to the capital Bau Bau (a 3 hour drive) using local public transport. Once there it’s sold to an exporter. Prices at the moment are low and La Sali told me only yesterday that his latest crop only fetched 3,800rp per kg (approx 28p). Unfortunately there is only one buyer in Bau Bau so people have no choice. All this takes nearly 2 weeks of extremely hard work per average sized farm to complete and in return they get about £100, which means a total of about £300 – £400 per year. 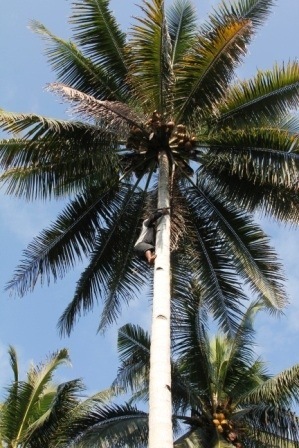 In return they risk their lives climbing to get the coconuts. There are frequent falls and internal injuries or death are not uncommon. 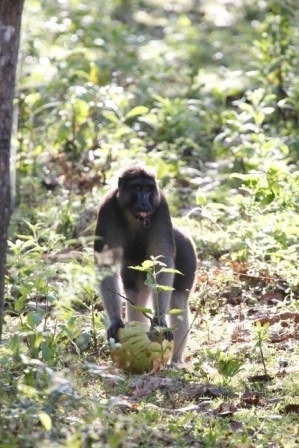 So you can imagine why they’re not that happy about monkeys stealing their coconuts! There are few ways to stop monkeys getting the coconuts. 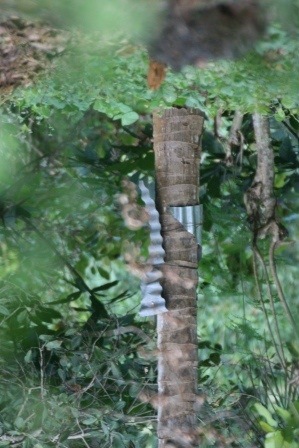 People have tried wrapping the trunks in things like left over roofing aluminium, to stop them climbing them but the monkeys just jump over it. The only option is to guard the farm all day. The problem is it’s not just monkeys that raid the crops. 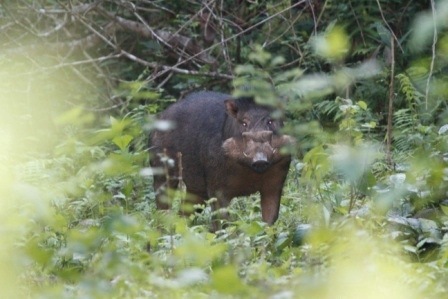 It’s also pigs, wild Sulawesi warty pigs. 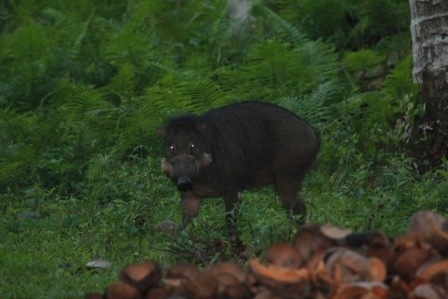 Although the pigs can’t get to the fruits in the trees they do destroy young coconut palms and eat any fallen, or harvested fruits and raid the drying husks too. The only way to stop them is high strong fences, which most people can’t afford or just simply aren’t possible in the terrain, or guarding the farm. 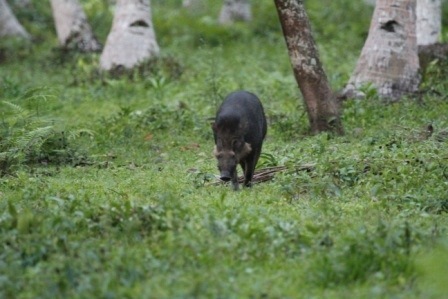 Pigs tend to come at night though so it means all day guarding against monkeys and all night guarding against pigs. These are some of the problems I’m working with farmers to find solutions to. 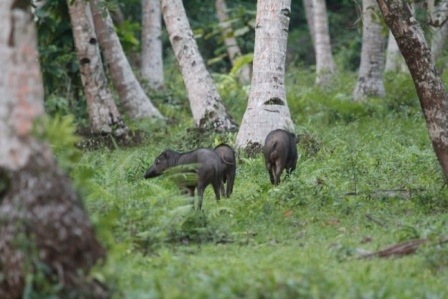 Like the monkeys the pigs are an endemic species and of conservation concern, and like the monkeys they are vulnerable to persecution. 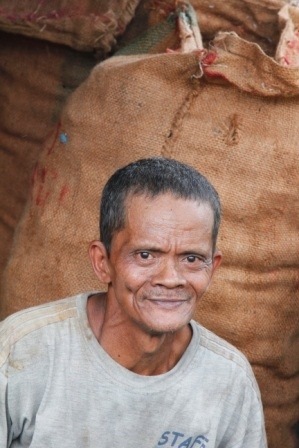 Sometimes farmers resort to desperate measures like poisoning or calling in the local Balinese community who bring their dogs and hunt the pigs to eat. I’m helping farmers to find solutions which let the wildlife live in peace and protect their livelihoods. in Uttarakhand HIMALAYAS (INDIA ) PEOPLE HAV LEFT FARMING DUE THESE TWO ENEMIES PIGS AND MONKEYS .ANY SOLUTION? It’s so hard to offer a solution without knowing all the details. I’m currently working on my final report at my high school in Gothenburg. 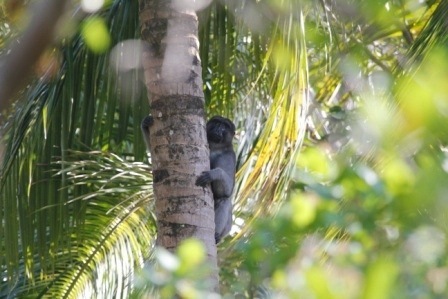 I’m studying the macaques in Kakenauwe and Lapago and was just wondering if it would be possible if I could use some the pictures from your blog? They are marvelous and to be honest, quite hard to get a grip on. What you work on is needed and I love your spirit so please keep on doing what you’re doing because it’s amazing. I would love to, the only complication is that it’s in Swedish so I’m unsure how useful it will be to you. But I’ll send it to you when I’m done! lol! Thank you 🙂 well I still look forward seeing it.